If you’re not drooling right now there is something positively wrong with you. Actually, these rolls made me think about my grandmother’s caramel sticky rolls. They are A-mazing and I need to get the recipe from my mom – soon!! Back to the current recipe…The rolls are pretty easy to make, although it takes a couple of hours since you have to let the dough rise. Make the dough and let it rise. Roll it out and spread on butter and a cinnamon/sugar mixture. 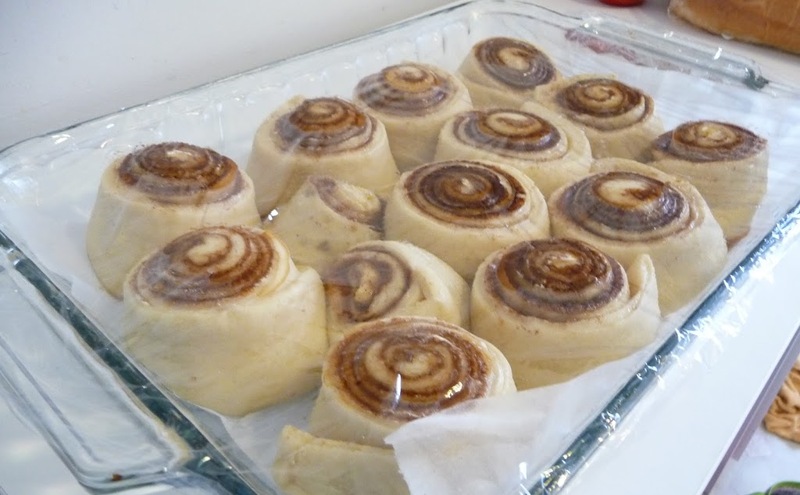 You roll that up and cut it every 2 inches into cinnamon rolls. 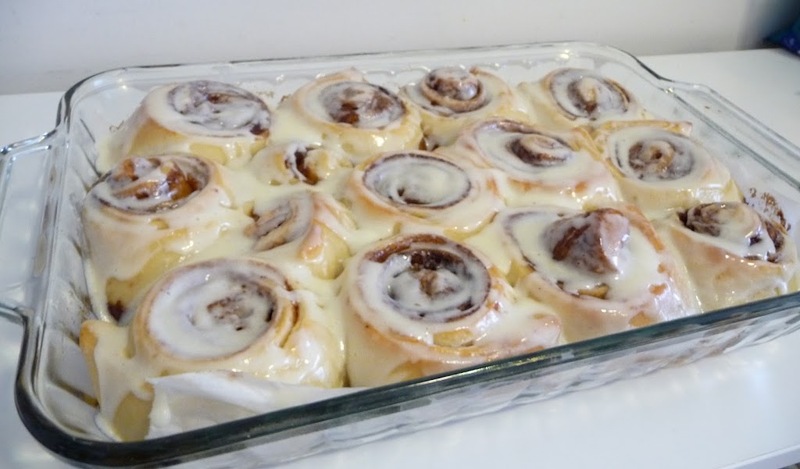 Place them in a greased 9×13 pan and let them rise one more time before baking. While the rolls are baking, whip up the icing and slather it all over the rolls as soon as you pull them from the oven. Let them cool a bit, slather with icing again and enjoy! These were supposed to be a breakfast for us, but I slept in late and finally got started on the rolls mid-morning. Then, I didn’t have them in a warm enough spot while rising, so they took too long to rise until I finally moved them. They ended up as an afternoon snack. That just proves these rolls are super any time of the day!! For the dough: Mix water, yeast and 1 Tablespoon of sugar in the bowl of your stand mixer. Let yeast proof for 5 minutes. (make sure it’s rising, in other words) Pour in remaining sugar and salt and mix. In a bowl, mix cinnamon, brown sugar, and cornstarch until thoroughly combined. Set aside. Punch dough down. Lightly flour a large surface (I just use a clean countertop) and begin rolling dough out, making sure it doesn’t stick to your surface. I usually roll mine out to around 16 x 24, but the goal is to just get the dough thin. 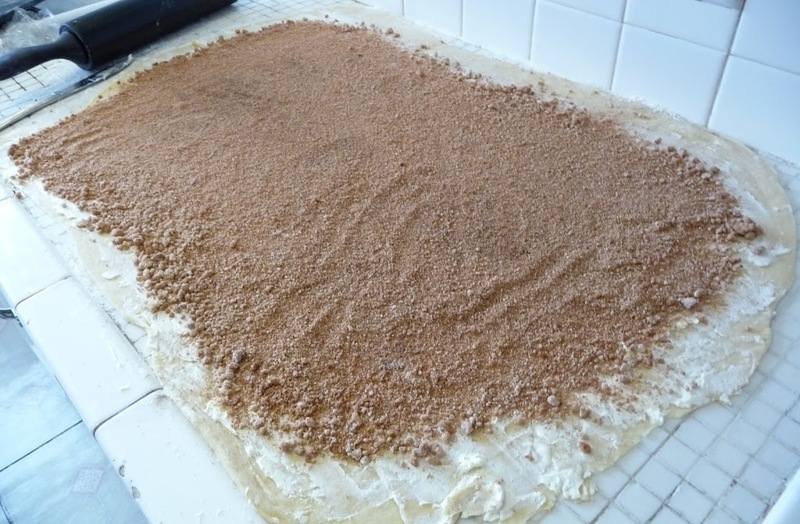 Spread margarine over the rolled out dough and top with the brown sugar and cinnamon mixture, leaving a 1 inch strip lengthwise, untouched. (This is so the rolls will seal when you roll them up.) Roll up in a tight log and end with the 1 inch empty strip. Seal the dough by pressing lightly. Bake in a preheated oven at 350 for 17-20 minutes, or until rolls start to lightly brown. Frost immediately, so the rolls stay nice and soft. 8. For the frosting: While the rolls are baking whip cream cheese and margarine together using stand mixer. Stir in the vanilla, corn syrup, and lemon juice. Add in the powdered sugar (slowly, so as not to make a mess). Mix on high for several minutes, or until frosting has lightened in color. 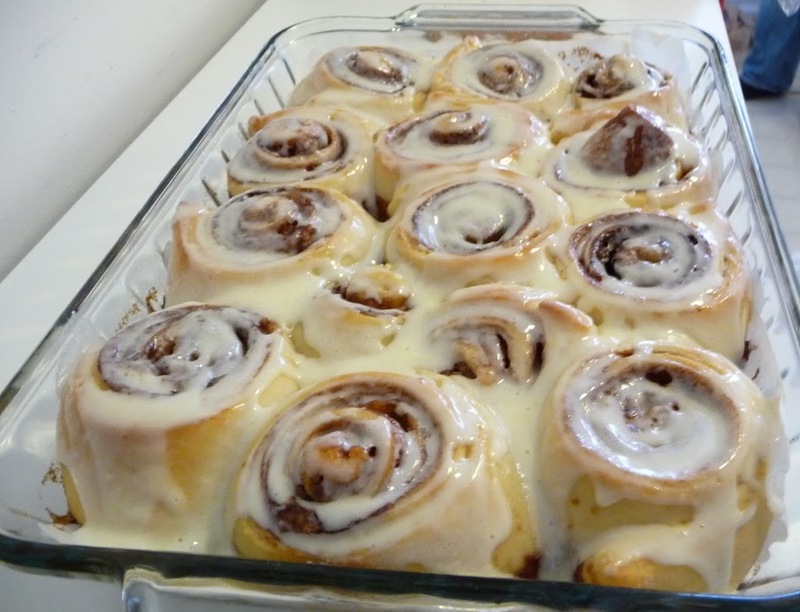 Frost immediately, then once rolls cool, use remaining frosting to frost again. *Most of the time I use a buttermilk substitute: 1 Tablespoon white vinegar for every cup of milk. Mix it together and let it sit for 10 minutes before using.